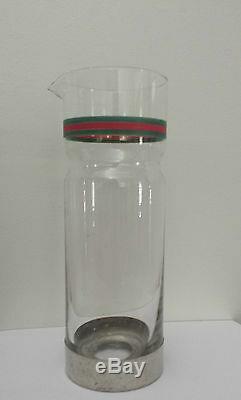 Rare Gucci 1970s water jug. The jug is 26.5cm tall and it has a diameter of 9cm. 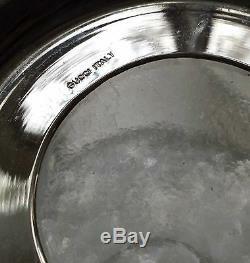 The silver plate base has a few marks and needs a polish (no loss of plate). 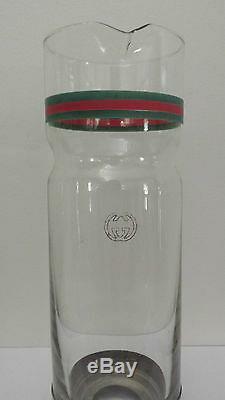 The classic green & red stripes have slightly faded and the gilded logo has wear otherwise it is in good condition. The item "Rare 1970s Italian Gucci Glass / Silver Plate Water Jug / Carafe" is in sale since Saturday, December 31, 2016. This item is in the category "Antiques\Decorative Arts\Glass\Jugs". The seller is "iclectic" and is located in Mount Eliza. This item can be shipped worldwide.